Rosh Hashanah is the time when we eat symbolic foods to express our deepest hopes for a good year to come. For Rosh Hashanah (and every Jewish holiday), we can give our children healthy food as a sign of our love and care. The healthiest foods are minimally processed fruits, vegetables, starchy vegetables, roots/tubers, intact whole grains, and legumes. These should make up most—if not all—of our daily calories. Giving our children healthy food on Rosh Hashanah is auspicious. On Rosh Hashanah, we say the Hebrew words “shana tova u’metukah,” which literally translates to may you have “a good and sweet new year.” A prerequisite for a good year is good physical and mental health. The food you serve to your children directly impacts their energy levels, weight, mental clarity and overall mood. Let’s fill our table with foods that improve our children’s physical and mental health. The simplest recipe of all. Raw apples are on your Rosh Hashanah table and easy to include it in your dessert line up for the holiday. This oil-free granola recipe is simple to make and delicious to eat. It is perfect for the High Holidays. Enjoy with plant based milks for breakfast, as a topping on sorbet or as a snack. 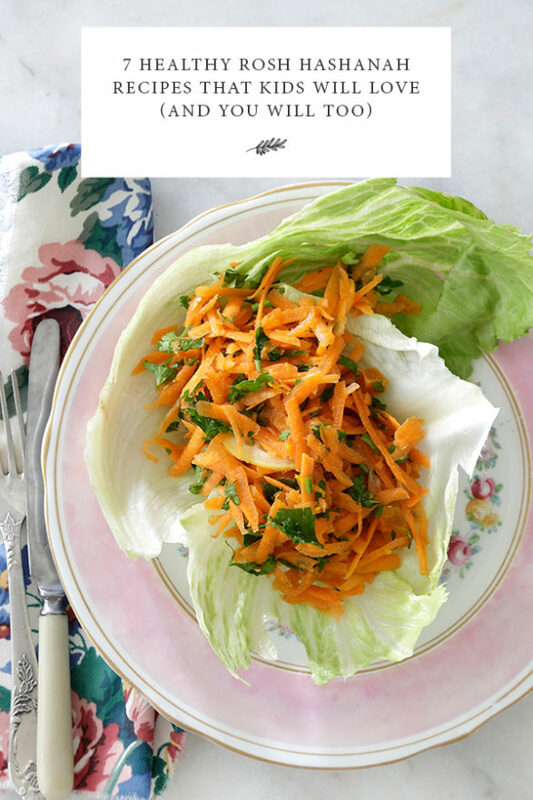 Carrot salad can be an exciting dish on your Rosh Hashanah table. And most kids like carrots! Yes, it is true that challah is part of the modern global Jewish script. And it is also true that eating challah does not feel good in the body. Challah is a very rich food and heavy in our children’s stomachs and in ours. We can serve healthy and delicious round bread for Rosh Hashanah. Here is a book that offers simple, healthy and delicious recipes. This grain based Rosh Hashanah recipe includes baked apples and pumpkin and raw carrots and cabbage. The apple tahini dressing is creamy and perfectly savory and sweet. The salad has color, crunch and flavor that children love. Try this healthier vegan apple cake recipe or this gluten free recipe. Your children will love it and you can feel good that they are eating healthier desserts. Your turn: Tell us in the comments what healthy recipes your children love for Rosh Hashanah.